Wilbanks, a blanket over her head, is escorted by police through the airport in Albuquerque, New Mexico. The district attorney is considering charges in the case. People are not quick to forgive the runaway bride. ATLANTA, Georgia (CNN) -- A suburban Atlanta prosecutor said Sunday he would be less likely to bring charges against runaway bride Jennifer Wilbanks if authorities determine she left spontaneously rather than planning her disappearance. "If she just freaked out and split, I'd be less inclined to hold her criminally responsible than if it were a deceptive plan all along," Gwinnett County District Attorney Danny Porter told CNN. But a source briefed on the status of the investigation said Wilbanks had bought her cross-country bus ticket several days before she disappeared, and had also made advance arrangements for a ride to the bus station. That account clashes with what the FBI said the 32-year-old medical assistant told investigators after she surfaced late Friday in Albuquerque, New Mexico. Wilbanks was scheduled to get married Saturday in front of 600 guests. She told investigators in Albuquerque that she embarked on her trip without a plan, leaving on "the spur of the moment" with $140 to $150, FBI spokesman Bill Elwell said Saturday. The stress of the wedding had gotten to her, and after the marathon runner went jogging Tuesday evening near her house in Duluth, Georgia, she took a taxi to a Greyhound bus station, where she boarded a bus to Las Vegas, Nevada, Elwell said. "She admitted she did cut her hair on her own," he said. "She did not want anyone to recognize her. She had some idea people were looking for her." A one-way bus ticket to Las Vegas from the Atlanta area costs about $170 -- more than investigators said she told them she was carrying at the time. The source briefed on the investigation said Wilbanks cut her hair Tuesday. After a night in Las Vegas, she befriended a Hispanic man and a white woman -- Wilbanks told investigators -- and the three took a bus to Albuquerque. Police in New Mexico and Georgia said no criminal charges were pending, but Porter said Saturday that no decisions would be made before Monday. Wilbanks had been scheduled to marry John Mason, 32, in a swank ceremony with 14 bridesmaids and 14 groomsmen. "She has spoken to her fiance," the statement read. "He cannot wait to see her. She says the wedding is not called off, just postponed." Wilbanks wore a brightly colored fabric over her head to hide her face as she exited the aircraft. Wilbanks initially told police in New Mexico she had been kidnapped, but she told them after questioning that she had fled voluntarily because she "needed some time alone" before the wedding, police said. Police located Wilbanks by tracing a telephone call she made to Mason to a convenience store. 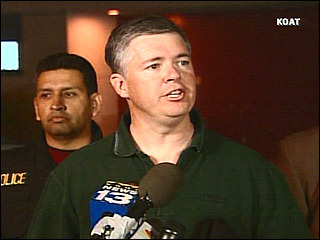 Wilbanks also made an emergency call to Albuquerque police. During that call, an apparently upset Wilbanks reported she had been kidnapped. But it took only a few hours of questioning for authorities to learn that Wilbanks left on her own. Duluth residents, including some of the 150 volunteers who had helped search for Wilbanks, had a mixed reaction to her return. Sunday morning, a near-capacity crowd packed into Riverbend Baptist Church in Gainesville, Georgia -- home of Wilbanks' mother and stepfather -- and heard the Biblical parable of the prodigal son from interim Pastor Ken Allen. When the story ended, the congregation of about 400 burst into applause. CNN's Charles Molineaux, Peter Viles and Rich Phillips contributed to this report.